This article is about the Crucible map. For the Gambit host, see The Drifter (character). "We need to clear the ship of enemy combatants." "How do we know they’re dead?" "Just kill ‘em till they stop moving. With the Hive, dead has always been a relative term." The Drifter is a Crucible map located in Foundling's Gyre in the Reef. 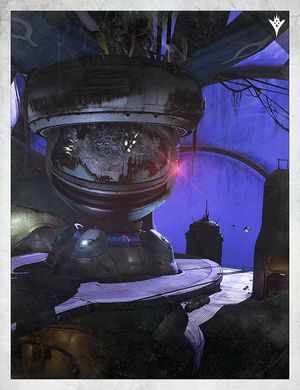 According to insignia and banners around the Pilot Servitor, this Ketch might have belonged to the House of Winter. Looking through a breach in the port side bay, large and heavily damaged spacecraft—presumably Golden Age in origin—can be seen drifting alongside the vessel. No other spacecraft are seen in vicinity, yet given that both craft were abandoned in their present orbit and lack of interest by the Reef, they have yet to be reclaimed or disapproved for use as Crucible arenas. Hive incursions in Reef space are rare, but as with all wounds the Hive inflict, their effects linger. “The Drifter” is a Ketch that faced such an infraction. The attack rendered its Servitor inoperable, overwhelming all self-repair subroutines, and so what remains has quietly been added to the graveyard encircling the Reef. Lord Shaxx decreed live combat within the layout of such a prominent Fallen ship design would be invaluable, and the Crucible claimed it soon after with no word of disapproval from the shattered Reef.